American cherry, a.k.a. 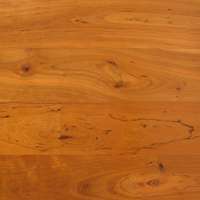 Prunus serotina is a colorful hardwood used to build furniture featuring a smooth texture and uniformly straight grain. Heartwood lies at the internal core, and cherry’s heartwood colors are a visual treat. The heartwood varies from rich red to reddish-brown. However, it darkens once exposed to light, which lends cherry an aesthetic delight for fine furniture lovers. Fortunately for woodworkers, cherry is distributed throughout the eastern USA, mainly in Pennsylvania, Virginia, West Virginia and New York State. Historically, the cherry tree has served us in many valuable ways other than as furniture. Of course, there is the beloved cherry itself, a healthy fruit. It is a pioneer species and is a moderately long-lived tree with ages of up to 258 years known. Although technically known as Prunus serotina, there are many common monikers for it. The American Hardwood Export Council lists it as American black cherry. But don’t be surprised to see variants of the species: wild cherry, rum cherry, and mountain black cherry. In order to enjoy success with any wood species, one must be aware of its strengths and weaknesses. Cherry wood colors and finishes beautifully, which are considered two primary benefits. However, cherry can also contain brown pith flecks as well as small gum pockets, which can diminish Cherry’s color and quality. Hobbyists and wood pros alike must be familiar with all its characteristics in order to safely work with cherry wood, including its working properties. According to the American Hardwood Export Council, cherry is one of the easier hardwoods with which to work. 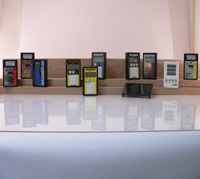 This list is not exhaustive, and do-it-yourself enthusiasts need to be familiar with the processes described below. All wood species on Earth, including cherry, contain moisture in the walls and nuclei of wood cells. Wood naturally continues to absorb and release moisture into the air based on changes in the relative humidity (RH) of its surrounding environment. In the kiln drying process, lumber mills dry the lumber to a target moisture content (MC) based upon the end products’ service requirements. When the wood’s MC is in balance with the RH of its surrounding environment, the wood is at its equilibrium moisture content (EMC). After the wood leaves the mill, even having achieved its EMC, cherry wood continues to interact with its environment. This is why the MC of the wood must be measured and managed in order to optimize cherry’s strength and performance qualities over time. Moisture meters for wood are essential moisture management tools. Lumber producers apply industrial forms of wood moisture management systems to all phases of wood production to ensure quality upon delivery. However, continuous environmental changes and domestic mishaps (such as moisture spills) exert their own impacts on a wood’s MC. Therefore, builders, hobbyists, and consumers must rely on moisture meters to verify that the wood has not been exposed to the dangers of excess moisture. Luckily, technological evolution has produced simpler, yet more precise moisture meters for wood. 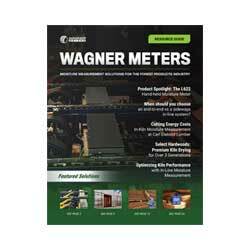 Wagner Meters produces hand-held wood moisture meters for softwoods, hardwoods, exotic woods, building inspection applications and even for wood finish applications. Their pinless moisture meter products measure and assess the MC of the material without leaving unsightly punctures or holes on the material’s surface. For woodworkers interested in working with cherry wood, a pinless moisture meter will provide all the information they need to accurately measure and assess the wood’s MC without leaving its mark on the beautiful and traditional cherry wood itself.